Tomorrow I'll sign the lease for my booth at Under One Roof (in Abilene, TX). Yesterday I received my shipment of display items. I still need to print price tags and a couple of other display signs I want. I've decided to postpone the web store setup, unless someone expresses interest for buying online. Right now I need to focus my resources on the booth and make more necklaces. After much thought I have finally defined my mission statement. My mission is "to create affordable beautiful quality jewelry." It's that simple. This is going to be one heck of a week! I've got two major things happening. First, I'm setting up online purchasing for my website. PayPal has a solution that allows people to pay via a credit card without requiring them to create a PayPal account. In addition, it also gives the customer an option to pay using a PayPal account. I'm currently revising my web pages to include the "buy" and "view cart" buttons. This should be complete in a couple of days. The second thing I'm working on is setting up a booth at a "Under One Roof". This is one of those craft places where you rent the booth monthly and pay the owner a percentage of your sales. For me, I'll pay $40/month 15% of sells. I'm still trying to figure out the best way to carry my jewelry around to retailers. As I was searching the web, I found this "My Jewelry to Go Travel Case". It looks like it might be a viable solution, and something I'd be comfortable with. But before I spend more money on something that doesn't work as well as I initially thought it would, I'm asking you, my readers, is there something better or a less expensive alternative? If I could sew, I'd try to create something myself. Unfortunately the best I can do is simple hand stitching. Please.. tell me fellow artisans, how do you carry and display your jewelry? If I had a nickel for every time some one has told me "earrings are easy", I'd have at least 25 cents! I suppose anything is easy if you know how to do it. Don't get me wrong. I can make some pretty decent earrings. My problem is that the length never matches. It has to do with where I'm bending the pin, but try as I might.. one earring always seems to be a little longer than the other. Maybe I can line my pins up and mark them somehow before I start bending. I added three of the necklaces I made last weekend to my web site. 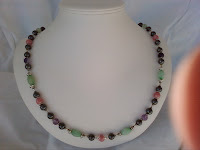 Including the "big bead" necklace (P0755). Or at least it's big compared to what I normally make. It is 24" long. I really should start adding the length to the descriptions on the web site. Gee, in addition to making jewelry, I've got to be a web programmer and digital photographer! So much to learn! I am trying to decide how I want to "push my wares". I have considered selling to local retailers. I even went out and bought the trays and carrying case that I read I would need. But those trays are heavy! I don't know how I can gracefully unpack anything. I don't know the protocol, so I feel pretty uncomfortable doing this. There is also the option of Internet sells. But I don't believe there would be a large market for this. I think the effort that would be required to bring customers to my site would be way more than I want to give. Craft show, flea markets and such is another idea. I've only been to a craft show once (as a browser). I didn't pay much attention to merchants side. This would require a bit of homework and I'd have to visit a few shows to know what participating would require (supplies, decorations, paperwork, how many necklaces, etc). Both the Internet sells and Shows would require me to process credit cards. This means more homework.. and overhead costs. There is another option. Today I visited a store (Crafter's Gallery) that rents booths and/or wall space monthly. They handle all the sells and taxes. They get 5% of the price you sell your item for. You don't have to be on location. You just put up your display, tag everything with your vendor number and the price. The owner write you a check once a month for the items sold. It's a cute place, very neat and clean with really nice stuff. I talked to the owner and she said I might want to use a locked cabinet to display my jewelry. She said they have never had problems, but it's best to be safe. I looked online at the prices for locked displays. OUCH! That's a big chunk of overhead. There has got to be another way to protect my stuff without spending $500! I like small beads, but I'm getting requests (more than one) for big bead necklaces. This got me wondering about what people like and what they are drawn to. I notice there are certain colors or beads that generate more attention than others. To satisfy my curiosity (and because I think it's cool), I added a Poll on the right side of my blog. Tell me what you like. You can select more than one answer. My nickel is on big. I've tried and tried to figure out how to wrap wire and have it look smooth. But I'm either doing it wrong or I just need a lot more practice. I would also like to start using jump rings in my designs, but I feel a bit insecure with them. It's hard for me to imagine that the wire won't slip through the ring. I guess I'll make a couple of necklaces with jump rings and wear them myself awhile. This should help me become confident in their durability.